It will come as no surprise to any of you that books are my bag. Books made me, books shaped me, and, more often than not, books saved me. I was a booky kid - too ginger, too gobby, too incapable of having anything on my face other than the true expression of what I really thought. This is not a character trait that has stood me in good stead over the years, politician I am not. But in the playground it was suicide. So, books were my friends, and bookshops were my favourite place in all the world, specifically an independent bookshop called Simmons hidden up a side street in the small Hampshire town where I grew up. (Why are bookshops always hidden? It's part of their enduring charm and eternal damnation.) Books were my treat of choice, Simmons my preferred destination. Dentist? Bookshop. Haircut? (Yes, I hated having my hair cut even then.) Bookshop. Back to school? Bookshop. Simmons bookshop,and the adults who recognised I needed an escape and encouraged me to read, engendered in me a life long passion for books and reading. A relationship that is amongst the best, the most successful, the most rewarding, in my life. Yes, I've got a kindle, and I love it, but I still buy and love books. Half the time I buy them twice (once on kindle and once 'for real'). The question of *where* I buy them constantly on my mind. Because I can't imagine a world without bookshops, a world where you can't push open the door and find something you'd never heard of, something that will transport you to a world you can't wait to leap into. But if we don't push open the door, before long bookshops won't be there any more, and personally I think that's a pretty crap place to be. So, that's why books are my bag. And Laura Bailey's and Lucy Worsley's and Bill Nighy's, and so many more's. If they're yours too, do something to support your local high street bookshop this Saturday. 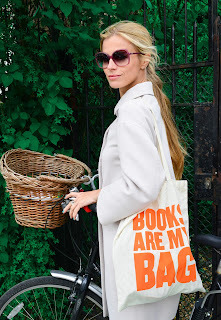 For more information on Books Are My Bag and events near you on 14th September, visit booksaremybag.com. Books are so my bag! It is the reason why my handbag is normally huge because tucked away in it's dark recess is a book! I can't imagine life without books! Books are definitely my bag. Books always been a haven for me. Been in hospital last few weeks & its books that are keeping me sane! I love bookshops but libraries are even better. I grew up in a small village that only had a mobile library which came every few weeks. There I learned that I hated Dr Seuss (gives me the creeps) but loved Nancy Drew. I'd be lost without books.